MOSCOW, Russia -- In 1787, Grigory Potemkin built hollow façades of villages in Crimea to impress Empress Catherine II that her army had conquered valuable assets. The reign of Russian Prime Minister Vladimir Putin has never been so fearlessly opposed in the country. Likewise, Vladimir Putin has erected a Potemkin democracy in Russia and in the past two weeks his façade has been outed by street protests that may lead to a "Slavic Spring." If the euro crisis had not hijacked headlines, the burgeoning Russian revolution over a fraudulent election would have because it has sweeping ramifications for oil prices, China's stability and the future of Ukraine. What has happened in Russia is historic because Mr. Putin's corrupt and ruthless regime has never been so fearlessly opposed. The game changer was this week when former Soviet president Mikhail Gorbachev declared the recent election marred by fraud and called for a re-run. Mr. Putin was president from 2000 to 2008, then stepped down to become prime minister and changed the constitution to allow himself to be president again for two consecutive six-year terms or until 2024. Mr. Putin's popularity was challenged a week ago when he strutted onto a wrestling ring and was roundly booed. This footage was captured on cellphones and went viral, demonstrating to Russians that criticism was OK if there was safety in numbers. Russia may become the next example of the power of the Internet to bypass censorship, propaganda and dictatorship. Russia has 60 million Internet users, the world's seventh largest online population. So China, with hundreds of millions of online users, should take note. This week's footage showing police arresting and abusing peaceful demonstrators was also reminiscent of Ukraine's Orange Revolution. I covered that historical event in Kiev, where a million turned out in toques and held candles in freezing temperatures, and by so doing were able to bring about an election re-run. This can happen in Russia. Protesters are mostly young professionals who realize they will never have opportunities in their own country as long as it is a rigged system where mostly cronies and crooks prosper. It's quite unbelievable that, given the poisonings and tyranny in Russia, people are on the streets chanting "Russia without Putin!" and "Putin is a thief" with impunity. It is quite compelling to watch interviews of well-known opposition politicians and activists, including Sergei Mitrokhin of Yabloko, who pull no punches. Their activities are admirable, and as courageous as have been those by Egyptians, Tunisians, Libyans, Yemenis and Syrians. If the "Russian Revolution 2.0" gains steam, there could be a dramatic impact on the world economy, oil prices, China and on the tug-of-war with Western Europe over Ukraine. In January, Russia closed in on Saudi Arabia as the world's biggest oil producer by hitting 10.5 million barrels a day. By 2020, production could reach 15 million barrels daily. Russia has become the world's fourth-largest economy (on a purchase-power parity basis), but the wealth has mostly flowed into the hands of oligarchs and corrupt government officials. Officially, the Kremlin has $580-billion in cash reserves, the lowest among the G20, or a mere 18% of its GDP. Political instability in Russia would drive oil prices upward. China's leadership would also be affected because their officials, eager to tap into Russia's oil, natural gas and electricity exports, have cast their lot with Mr. Putin in a very public way. Beijing awarded this year's Confucius Peace Prize to Mr. Putin because he went to war in Chechnya in 1999. Here was what the "judges" said: "His iron hand and toughness revealed in this war impressed the Russians a lot, and he was regarded to be capable of bringing safety and stability to Russia. He became the anti-terrorist No. 1 and the national hero." It was a bizarre, Potemkin-like pronouncement designed to curry favour with Russia, which is now shipping oil to China. Likewise, the battle to capture Ukraine will depend a great deal on whether Mr. Putin - who wants to rebuild the Soviet Union - is seriously bruised by these developments or not. I believe he has been, which will encourage Ukrainians to opt for the West rather than for a more robust Russia under Mr. Putin. 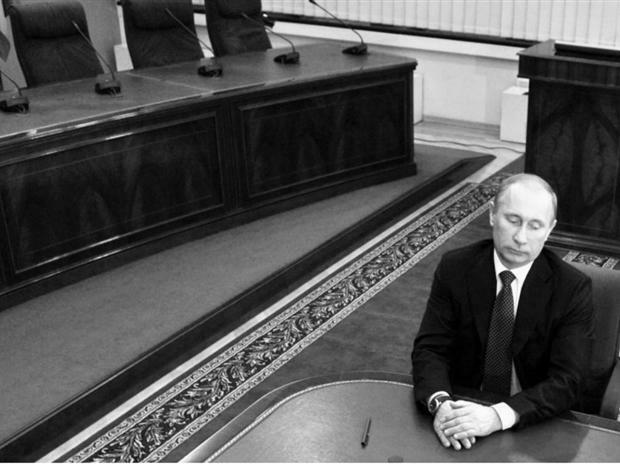 The euro negotiations are critical, but so are Russia's politics. Much depends on whether Russian activists are able to convince tens of thousands of protesters to fill streets this weekend. If not, it will be a Potemkin presidency. If they do, all bets are off on oil prices, Russia's leadership, Chinese stability and Ukraine's decision as to join West or East.